Winner of African Cup of Nations Egypt 2006 . Winner of African Cup of Nations Ghana 2008 . Bronze Medalist at FIFA Club World Cup 2006 . Winner of CAF Champions League 2006 . Winner of CAF Champions League 2005. Winner of African Super Cup 2006. Winner of Egyptian Soccer Cup 2006. Winner of Egyptian Super Cup 2006. Winner of Egyptian Super Cup 2005. Hassan Mostafa is an Egyptian footballer. He plays the Defensive midfielder position for Egypt's African Super Cup Championship club Al-Ahly as well as Egypt's National Football Team. He is an outstanding midfielder who is a regular contributor to both his club and country’s success. 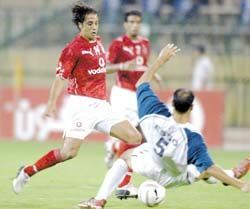 He has played a large role in Ahly winning the CAF Champions League 2005 and CAF Champions League 2006. He appeared for Egypt five times during their glorious campaign in the African Cup of Nations Egypt 2006. Hassan Mostafa is famous of his hardwork, and speed, It is also hard for any competitive attacker to pass through him. He also has many attempts on the goal, and scored 4 goals in the Egyptian League (2005-2006) for Al-Ahly.